David Mermin thanked me for finding a glitch in one of his papers. I can retire now, right? The matter concerns “Hidden variables and the two theorems of John Bell” [Reviews of Modern Physics 65, 3 (1993), pp. 803–15]. Specifically, we turn our attention to Figure 4, the famous “Mermin pentagram,” reproduced below for convenience. 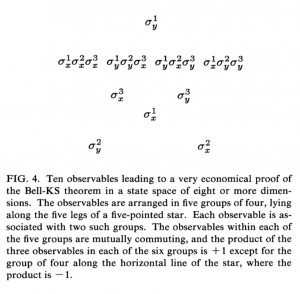 Ten observables leading to a very economical proof of the Bell–KS theorem in a state space of eight or more dimensions. The observables are arranged in five groups of four, lying along the legs of a five-pointed star. Each observable is associated with two such groups. 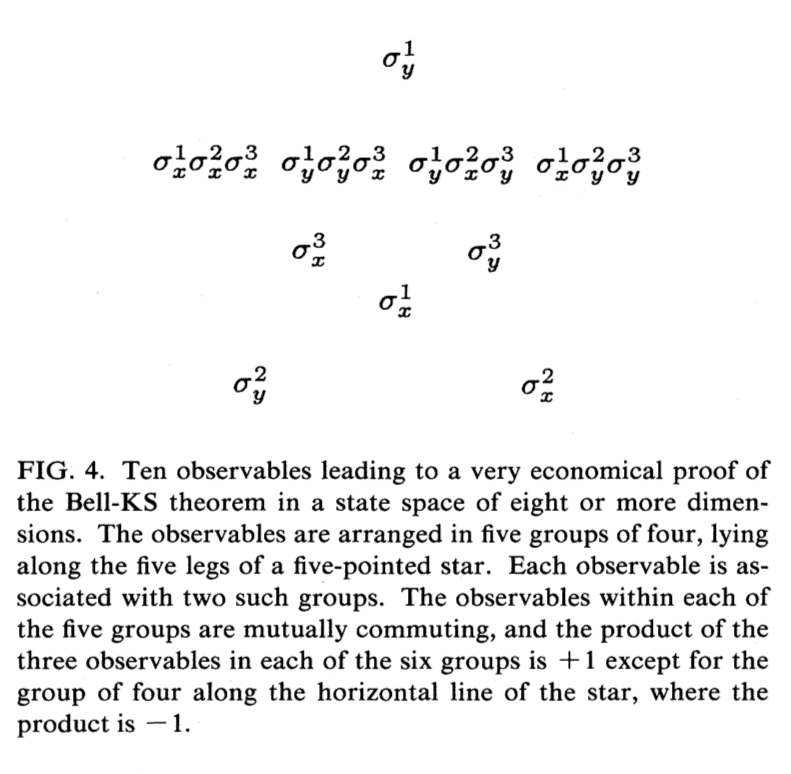 The observables within each of the five groups are mutually commuting, and the product of the three observables in each of the six groups is $+1$ except for the group of four along the horizontal line of the star, where the product is $-1$. In that last sentence, “three observables in each of the six groups” should instead read “four observables in each of the five groups” (in order to agree with the diagram, and to make sense). Glitches and goofs can happen to anybody. I’m embarrassingly prone to them myself. I also have the pesky kind of personality that is inclined to write in when I find them. This has led to a journal-article erratum once before, and now that I think about it, it provided the seeds for two papers of my own. As they say about Wolverine, being per-SNIKT-ety pays off!